Formal development in Event-B generally requires the validation of a large number of proof obligations. Some automatic tools exist to automatically discharge a significant part of them, thus augmenting the efficiency of the formal development. We here investigate the use of SMT (Satisfiability Modulo Theories) solvers in addition to the traditional tools, and detail the techniques used for the cooperation between the Rodin platform and SMT solvers. 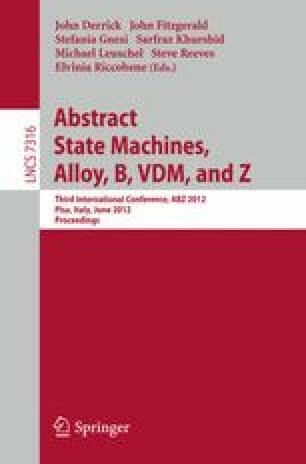 Our contribution is the definition of two approaches to use SMT solvers, their implementation in a Rodin plug-in, and an experimental evaluation on a large sample of industrial and academic projects. Adding SMT solvers to Atelier B provers reduces to one fourth the number of sequents that need to be proved interactively. This work is partly supported by ANR project DECERT, CNPq/INRIA project SMT-SAVeS, and CNPq grants 560014/2010-4 and 573964/2008-4 (National Institute of Science and Technology for Software Engineering—INES, www.ines.org.br ).